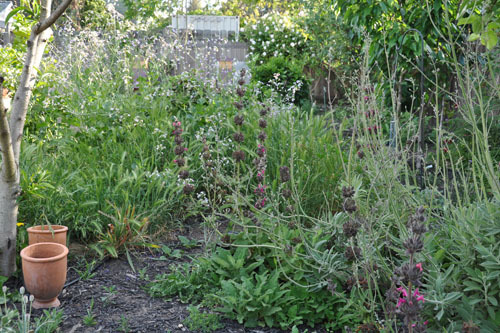 So while we were away, the garden kind of exploded. 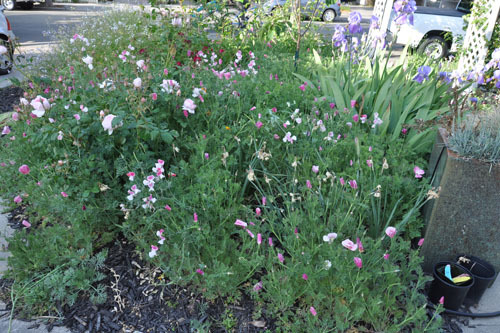 The smaller side of the front garden is hip-deep in poppies and, amusingly, sweet peas. 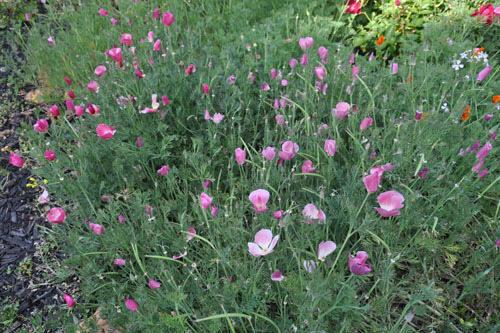 They seeded themselves here and it's just kind of funny how they are growing all over the California poppies. The back is just as insane. This used to be a path. And, well, a lemon tree. Can you see the lemon tree back there? Because I can't. There's a 4-foot tall fluffy flower in front of it. Well before we went away for weeks and got even more behind on things, the gardeners gave me an estimate for redoing the paths with bender board and some decomposed granite. I guess it's time to dig that out and take a serious look at it. This week I've been taking out my compulsive nature on the California poppies. There are always a few orange ones mixed in with the pinks, and I weed them out to keep them from reseeding everywhere. I'm just way behind on that since all this came at me at once. And somewhere under all those poppies is also the rose hedge, which is slowly recovering from the Big Transplant that came with building the retaining wall. 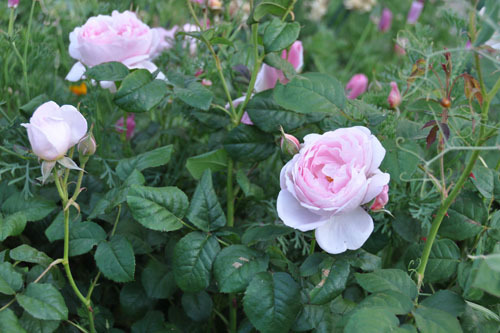 A few rootstock roses are showing up, too; I need to dig those out. The oriental poppies are still going strong, too. 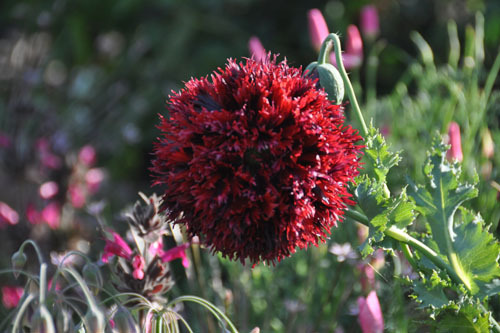 This one is, I think, Papaver "Black Swan". I'm not sure where the tags are but the poppies themselves are a bit of a mess right now. Living in California, the signs of the seasons changing are more subtle than they were where I grew up and learned to garden. 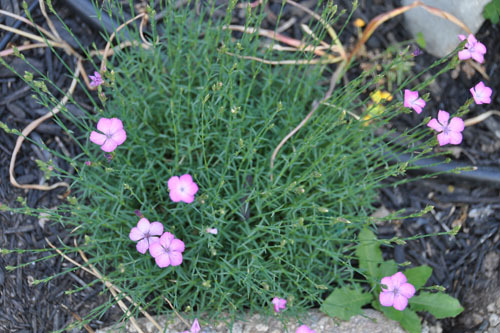 My first sign of summer, though, is the dianthus in bloom. This year it feels like they started really early, but I think they're right where they've always been; the garden is just not awash in weeds. The new bees are doing well, too. 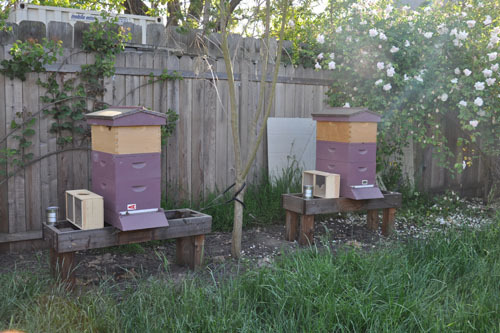 They've settled into their hives and are mostly being calm and well-behaved. Noel was able to mow one side of the lawn the other day and it should be safe to mow the bee side soon. The noise and smells of lawn mowing can upset bees who aren't fully attached to their hive and make them abscond, but after four or five days they should have gotten used to the place and spread their new queen's pheromones around enough to be OK with some disruption. I'll go into both hives this weekend to check on things and retrieve the queen cages, then they get to be on their own for a while.